Mangshi is the countryseat of Luxi County and also the prefectural seat of Dehong Prefecture. Mangshi means "the Town of Daybreak". The name originated from the story that Sakyamuni got to Mangshi just as day broke. The town has an area of 10 square kilometers and a population of 60,000. 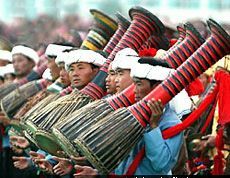 Mangshi is a newly developing border town, will prosperous business and booming trading. The monastery is situated in the middle section of Xinan Road, Mangshi. 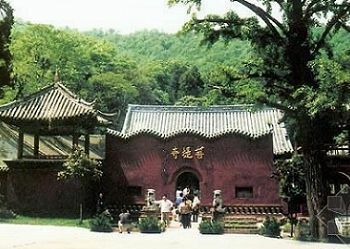 It is said to have been built in the early Qing Dynasty. The monastery got its name because there was a bodhi tree in front of the monastery when it was built. The original monastery was destroyed in a war. Later repeated reconstructions and repeated destructions happened. The existing monastery was built in 1978. The roof is of a Han style, but the architecture as a whole and especially the balustrade and railing are of a Dai style. 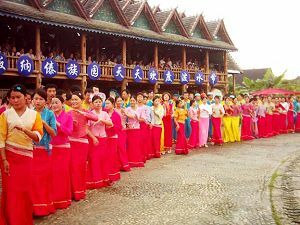 The Minority Cultural Palace is located in the southern section of the Youth Street, Mangshi. It covers an area of 150 square kilometers. The splendid palace, hidden among oil palm trees and bamboo trees, has distinctive ethnic features. To its north there is "the Pavilion of the White Dragon", which is the symbol of the Dai's Water Splashing Festival. The Cultural Palace was built in 1988 by the people of Dehong in memory of Premier Zhou. There are several bus stations in Mángshì. Both the long-distance bus station in the north of town and the southern bus station offer similar destinations at similar prices and schedules. If you don’t find your bus at one, trudge along to the other. A bus stand situated a block southwest of the southern bus stand has the most frequent departures to Wǎndīng (Y20) and Ruìlì (Y20, 7am to 8pm). Minibuses leave when they’re full so you will need to be prepared to wait. The airport is 10km from the city. There are daily flights between Mángshì and Kūnmíng (Y790). There are no buses from Mángshì airport to the town centre so you’ll have no choice but to negotiate with the taxi sharks at the airport (Y20-25). Minibuses to Ruìlì (Y30, two hours) usually wait at the airport for incoming flights. Buses leave the Mángshì Yunnan Airlines (Wenhua Lu; 8.30am-noon & 2.30-6pm) office for the airport around an hour before flight departures.